I've had a lifelong love-hate relationship (OK, more like hate) with polka dots. They look so cute and femme on others but when I've tried to work them into my wardrobe in the past they've always felt a bit too dainty. Well, times are a changing. I'm finally embracing polka dot prints and plan on playing the pattern into the fall. Great inspi. I love polka dots :-). I'm glad you're embracing polka dots! I love them. They are so flirty and feminine! 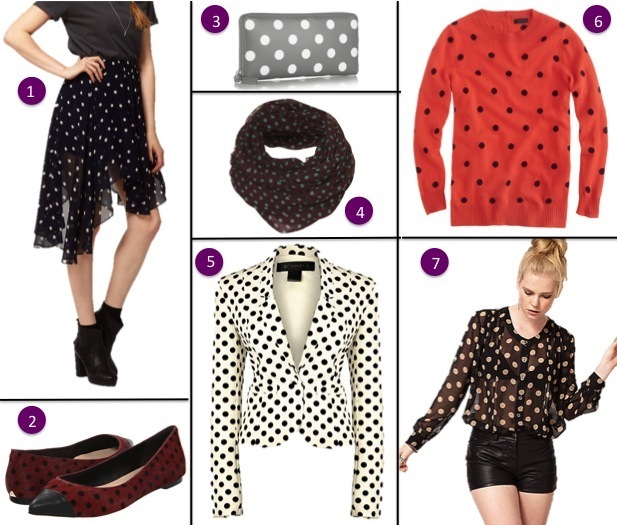 Polka dots are a slight obsession of mine, so I'm so glad that fall fashion is so full of them! I love those flats! I have never met a polka dot I haven't liked so you can imagine how much I love this post! Loving those polka dot pointy flats! I have always loved polka dots! Love polka dits! Great post! I'm not sure if I've had enough of polka dots by now or if I just need some rest (or whatever)... but still, this Minkpink blouse is soooo pretty! I love everything polkadots! Especially the skirt that you chose! Hey girl! So cute! Love this!! love polka dots for fall! Love this! I can't help but fall for polka dots lately, too. Thanks for the comment and for following me! I'm following you via bloglovin too :) Can't wait to see more! Those pointy flats are lovely!! Polka dots are cute! I love mixing them in with a bit of leather and some spikey bracelets and arm candies to make the look more edgy! i just found your blog and i am so glad i did! polka dots are my absolute favourite! :) I am your newest follower on GFC and would appreciate if you could do the same back. your blog is so lovely and i cannot wait to read your next post! Nothing better for looking pretty than polka dots, the flats are adorable! i am so in love with the polk dot trend right now! i work for kate spade and that is all the rag there! I personally don't wear much polka-dots but I think these outfits are pretty cute. My favorite has to be the leather shorts and long sleeve turquoise top. Love connecting the dots! I started following you on GFC and I hope you will followme too! Good post!! I love everything with dots! I love polka dots but it's not so easy to find the perfect one....Loving the sheer top #7 so much! I love polka dots. Trust me, it will grow on you. You just have to find the right size of "dots". loveeee all of the polka dots popping up everywhere - definitely a fun print! i love polka dots!! 3, 4 + 6 belong in my closet!! Love this post!!! Both your collages are soooo so chic!